Referee Andy D'Urso sends off Peterborough United's Joe Newell during the Johnstone's Paint Trophy Final. Photo: Mike Egerton/PA Wire. Joe Newell learnt a lot from his last Peterborough United game against Chesterfield, even though he suffered a moment of madness. The in-form midfielder was sent off against ‘The Spirites’ in the Johnstone’s Paint Trophy Final at Wembley in March for kicking opposite number Sam Morsy. It was the low point of a pretty difficult season for the 21 year-old, one where he struggled to convince the club’s supporters that he was worth a place in a promotion-chasing side. 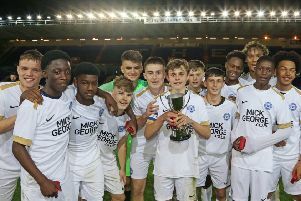 Luckily for Newell, the first red card of his career didn’t stop Posh lifting the Trophy as they beat a side heading for the Division Two title 3-1. Newell was still downcast that evening, but his reponse since has been impressive. He collected the fans’ player of-the-month prize for November before last Saturday’s defeat by Preston, a game he had to watch after collecting another red card in the previous week’s win over Leyton Orient. “It was a big mistake from me in the JPT Final,” Newell admitted. “It was a moment of madness, but one that I’ve learnt from. It was a heat of the moment reaction for which I was properly punished and I’m just thankful that we still went on to the win the game. “I’ve put that moment right out of my mind now. I won’t be thinking about it just because we are playing Chesterfield. “Chesterfield were a very good footballing side at Wembley and they’ve carried that form into this season so it’s a tough game for us. “It hurt having to watch the game against Preston, but I felt we played well and were unlucky to lose. “I’ve enjoyed this season from a personal point of view. To be fair to the manager he always stuck by me even when I was struggling and in the summer he just told me to be more consistent and then I’d get a good run of games in the side. “That’s exactly what’s happened. Every player will tell you that if you’re reasonably sure of your place in the side you will relax and play better. “It’s time for me to make my mark now. I’m not a kid any more and there are many players at the club who are younger than me. “I can still improve. I need to score more goals for a start and that is one of main aims for 2015. I always played centre midfield as a kid so I’m certainly happy playing that role now.